Saraswati puja is a major Bengali religious and cultural festival, especially for the Bengali youth. Although Saraswati puja celebrates knowledge, learning and the fine arts, but it also had a romantic touch to it. The spring time weather, the mild warmth of sunshine, the red Krishnachura and Palash blooming all around – it is the perfect time for romance and Saraswati Puja. In this country (especially in the north east), Saraswati Puja is celebrated in the peak of winter – and just like the Goddess, the landscape around covers itself in white. We would have to cover our nice festive dresses in heavy winter clothing and trudge through snow, ice and slush to visit our revered Goddess of learning. But we the expatriates, many of whom are indebted to Maa Saraswati for her blessings, carry the warmth of spring in our heart. Just as we enter the Puja venue, we feel transported back to those days when we used to go around door to door to collect contributions for our club Puja, building and decorating the pandals, waking nights to decorate the venue and have a great time. We also had several rules that needed to be followed – like, we couldn’t eat “Kool” (the sweet and sour berry), no studying on the day of the Puja, and after the Puja write Saraswati’s name on the “Bel” leaves. No such restrictions need to be followed here, but sometimes we feel a small tinge when we see our kids missing out the fun. In New Jersey, Saraswati Puja is celebrated by several clubs and organizations. Since most clubs are celebrating the Puja on different dates, you can visit multiples of them and enjoy. To the best of my knowledge, the earliest celebration is by Garden State Cultural Association (GSCA) on Feb 5th, Saturday, at Woodrow Wilson Middle School, Edison. Besides variety cultural program and Puja (Anjali, Hate Khari), GSCA will also have various kids activities such as arts and crafts competition, essay competition, etc. And of course prasad and dinner would be served. Visit http://www.gsca.us/saraswati_11.html for more information. 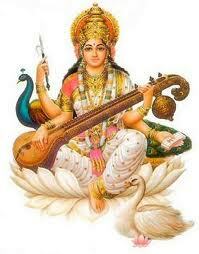 Anandamandir will celebrate Saraswati Puja on Feb 8th at 8.45 am. For hate khari timing, call Bisabhai at 732-873-9821. The Somerset Bengali Association (SBA) will be celebrating their 4th annual Saraswati Puja on Saturday, Feb 12 at the Green Brook Middle School, 132 Jefferson Ave (Near Route 22), Green Brook, NJ 08812 . The SBA Puja is a relatively new and growing event and the goal of SBA is to offer a homely informal atmosphere and relaxed socialization at their event. SBA cultural program will feature dance, music, plays by local talents and also SaReGaMaPa USA finalist Rasika Shekhar. SBA not only offers its guests a great dinner, but also a full lunch to keep you engaged all through the day. ICC celebrates their Saraswati Puja on Feb 13th, 2011 at the Ukrainian Cultural Center, Whippany from 2pm onwards. Besides a variety of program performed by ICC children, there will also be a musical performance by a well known local artist. New Jersey Puja Association will be celebrating their Saraswati Puja on Feb 19th. However, they have not announced their venue as yet. NJPA’s Saraswati puja will be held at Kiddie Keep Well Camp in Edison this year on Feb 19th. An exciting cultural program featuring local talents is in store for all as well. Sreeshti – Sarawasti Puja 2011 will be held on Feb 12th 2011. For more info visit http://www.sreeshti.com.